The European Union is considering giving a new EU border force powers to intervene and guard a member state’s external frontier to protect the Schengen open-borders zone, EU officials and diplomats said yesterday (4 December). Such a move might be blocked by states wary of surrendering sovereign control of their territory. But the discussion reflects fears that Greece’s failure to manage a flood of migrants from Turkey has brought Schengen’s system of open borders to the brink of collapse. Germany’s Thomas de Maizière, in Brussels for a meeting of EU interior ministers, said he expected a proposal from the EU executive due on 15 December include giving responsibility for controlling a frontier with a non-Schengen country to Frontex, the EU’s border agency, if a member state failed to do so. “The Commission should put forward a proposal … which has the goal of when a national state is not effectively fulfilling its duty of defending the external border, then that can be taken over by Frontex,” de Maizière told reporters. He noted a Franco-German push for Frontex, whose role is largely to coordinate national border agencies, to be complemented by a permanent European Border and Coast Guard – a measure the European Commission will propose on 15 December. Greece has come under heavy pressure from states concerned about Schengen this week to accept EU offers of help on its borders. Diplomats have warned that Athens might find itself effectively excluded from the Schengen zone if it failed to work with other Europeans to control migration. On Thursday, Greece finally agreed to accept help from Frontex, averting a showdown at the ministerial meeting in Brussels. After threatening Greece with triggering rules allowing for internal border controls within Schengen for up to two years, the ministers meeting in Brussels on Friday have not asked the bloc’s executive arm to activate the procedure. “It is not legally possible to exclude a state from the Schengen area. 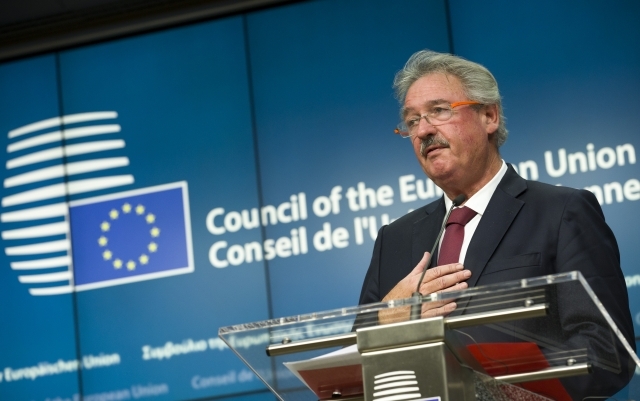 We cannot expel or exclude a member state from the Schengen area… We weren’t targeting any country in the north or the south or the centre,” said Jean Asselborn, the minister of foreign affairs and migration of Luxembourg, which first tabled a paper invoking the two-year rule. EU diplomats said the proposals due on 15 December to bolster defence of the external Schengen frontiers would look at whether the EU must rely on an invitation from the state concerned. “One option could be not to seek the member state’s approval for deploying Frontex but activating it by a majority vote among all 28 members,” an EU official said. Under the Schengen Borders Code, the Commission can now recommend a state accept help from other EU members to control its frontiers. But it cannot force it to accept help, something that may in any case not be practicable. The code also gives states the right to impose controls on internal Schengen borders if external borders are neglected. As Greece has no land border with the rest of the Schengen zone, that could mean obliging ferries and flights coming from Greece to undergo passport checks. Asked whether an EU force should require an invitation or could be imposed by the bloc, Swedish Interior Minister Anders Ygeman said: “Border control is the competence for the member states, and it’s hard to say that there is a need to impose that on member states forcefully. Ministers and the Commission welcomed Greece’s decision on Thursday to accept more help from Frontex. A dramatic increase in EU powers over national territory would be deeply controversial in much of Europe. On Thursday, Danes, who are part of the Schengen zone, heeded Eurosceptic calls and voted against giving their government power to deepen its cooperation with the EU police agency. The European Union faces another test over the next two years as Britain, its second biggest economy, prepares to hold a referendum on whether to quit. Although not a member of the 26-nation Schengen zone, and so unaffected by increased powers for EU border guards, increasing Brussels’s say over security policies in Schengen states might fuel the campaign to leave. The Council approved the compromise text agreed with the European Parliament on the proposal for a directive on the use of passenger name record (PNR) data for the prevention, detection, investigation and prosecution of terrorist offences and serious crime. “The compromise agreed today will enable the EU to set up an effective PNR system which fully respects fundamental rights and freedoms”, said Etienne Schneider, Luxembourg Deputy Prime Minister, Minister of Internal Security and President of the Council. The directive aims to regulate the transfer from the airlines to the member states of PNR data of passengers of international flights, as well as the processing of this data by the competent authorities. The directive establishes that PNR data collected may only be processed for the prevention, detection, investigation and prosecution of terrorist offences and serious crime. Under the new directive, air carriers will be obliged to provide member states’ authorities with the PNR data for flights entering or departing from the EU. It will also allow, but not oblige, member states to collect PNR data concerning selected intra-EU flights. Each member state will be required to set up a so-called Passenger Information Unit, which will receive the PNR data from the air carriers. The UK and Ireland have opted in to this directive. Denmark is not participating. “giving responsibility for controlling a frontier with a non-Schengen country to Frontex” & “It’s not mandatory, but in practice it’s quite mandatory.” ? How is that not an occupy of a Nation State ? As the peoples of Europe turn against the EU Brussels response is becoming evermore authoritarian. Fascism, Nazism, Communism and now Europeanism. Different flags & different anthems but the same crazed lust for power over the peoples of Europe. Thank god we are leaving their decaying EU. The British union needs a little of nation states purification too……. Can we first remember that Frontex has under 350 employees and an annual budget of just €142.6m so their ability to take over and guard the external border of even a single EU state is frankly laughable. But let that pass and let’s assume that the EU can get the necessary funding from the Schengen states (I doubt the UK would want to contribute being outside the agreement). Then we have the proposition that this could be enforced on a state by QMV. So we have to imagine busloads of border guards from other EU states turning up (with a Frontex arm badge?) and telling the local staff and population that they are now in charge because a majority of other countries have decided that it should be so. All this in an agreement that in the finest traditions of the EU has no legal mechanism to expel or exclude a state that others have decided are not acting as they wish. Can’t see any problems with any of this at all, can anyone else? It’s a good plan to have a border agency that works alongside national border police everywhere, all the time. But that’s not enough, to stop the flow of refugees onto the roads, streets and city centres you need to have somewhere for them to go to. There needs to be a facility that can house a million, a city basically, because after the first million refugees landed here there will be another million coming, and another one after that. The quicker we get to a proper solution and the less time waffled about the better it will be for everybody. Expanding agencies, creating new ones, spending more of other people’s money for duplication activities, when is enough – enough for you? As long as your new city of migrants is in Germany I don’t think many people will mind, after all why should any other country suffer for German arrogance. Germany asked for them so Germany can have them, all of them. We sell physical loaded ATM cards . It is a corned card that can be used to withdraw Cash at any ATM Machine. This Cards comes in Visa/MasterCard. Therefore it works at any ATM Machine that accept Visa/MasterCard Worldwide. If you are in the USA, you will receive your card in 48 HOURS with guaranteed. If you are outside the USA, Your card will arrive to you between 3 – 5 business days guaranteed. DO YOU ALSO RELOAD ANY OTHER CARD NOT FROM THIS CORNED CARDS?